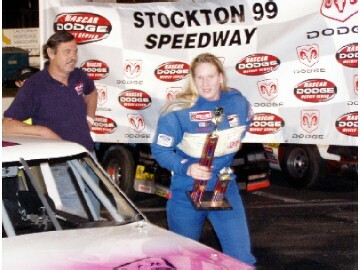 STOCKTON — Chowchilla's Eric Humphries, #32, got the jump on San Rafael's Allison Duncan in the Western Late Model main and led all 30 laps to win his first race Saturday night at Stockton 99 Speedway. 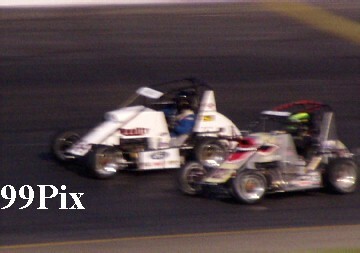 Turlock's Chris Monez had the fast time of the night, but started sixth on the invert. 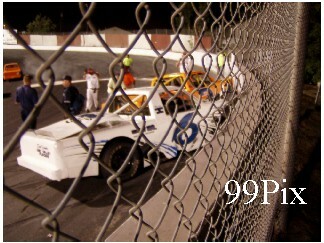 He finished third, just short of what he worked for, but improved his standing on double points night at the quarter-mile track. 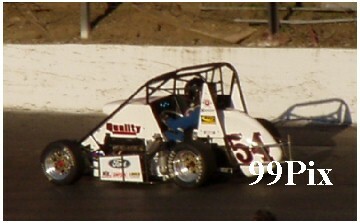 Monez entered ninth in points. "We couldn't close," Monez said. "We needed a caution. We were sixth and had to pass every one of them." Duncan finished second. Points leader John Moore of Granite Bay came in eighth. Sacramento's, #5, Jason Philpot survived a caution-filled Grand American Modified race that whittled the field from 18 to nine. Ripon's Mike Regelman finished fourth. Two-time defending Pro 4 Trucks champion #27, Carrie Miller won that 30-lap race in her first appearance at the track this year. Oakdale's Nathan McNeil finished third. 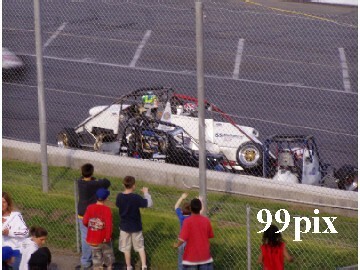 Three trucks nailed the wall in turn 1 . 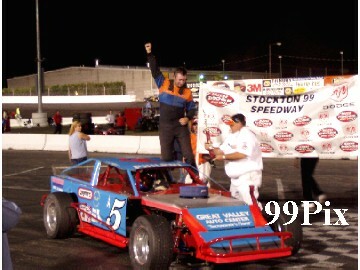 They were #6Mark Henslee of Lathrop, #64 of Lodi, Danny Basto, and #3 Ron Robeck of Milpitas. 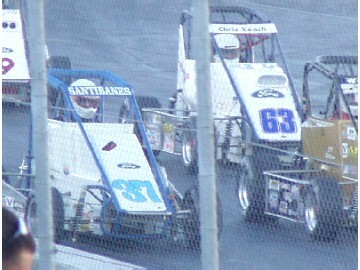 Manteca's Jacob Gomes, #16, of Manteca, won the California Mini-Cups main event and trophy dash. 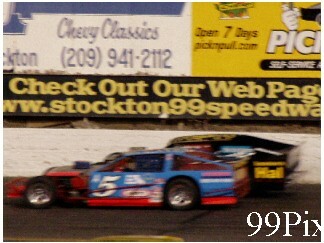 In the ALSC 30-lap main Charlie Clawson of Modesto outlasted Kannai Scantlen, (who tried dirt trackin' on asphalt, again), and Chad Holman, both of Stockton to land in the 30-lap main winner's circle. 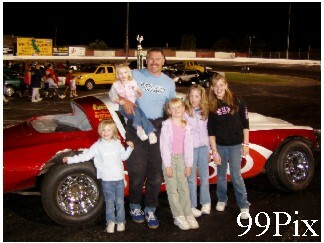 Donnie Darter, #99, of Stockton broke the ALSC track record again this season, lowering it to 15.746!. Alex Harris, #54, of Simi Valley, Calif. can tie the record for consecutive single-series USAC Ford Focus feature wins this Saturday night, after surviving a late-race battle with #82, Robbie Whitchurch to take the checkered flag Saturday night at Stockton 99 Speedway. 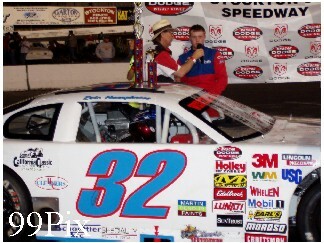 The win was his third in a row in the California Pavement Ford Focus series. 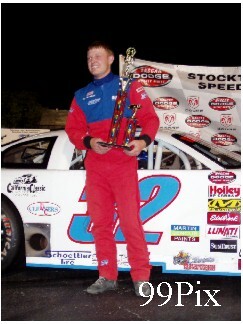 Tate Martz set the single-series Focus record of four straight wins during last year's Midwest series. 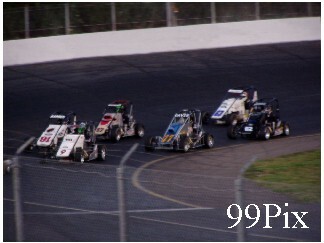 Trailing Harris at the finish were Chase Barber, Matt Triplett, Benny Moon and series point leader Audra Sasselli, as Whitchurch spun while leading and encountering traffic on the final lap. 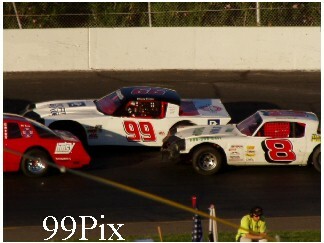 Harris led the first 24 laps before yielding to Whitchurch, who led the next five before the spin.